It was in February of 2013 when 47-year-old Dhali Moham accidentally touched a mass in the left side of his neck one day and found his illness. The mass was not itching or painful, so he didn’t go to hospital but buy some medicine in drug store instead. After a couple days, the mass did not shrink. Contrarily, it grew bigger and bigger and brought strong impact to his life. Dhali Moham could not eat or sleep and later was beset with symptoms like abdominal discomfort, pain and cough. His looked pale and his weight dropped 5kg. It was not until April of 2013 that Dhali Moham accepted a biopsy of the left lymph nodes in local hospital, which diagnosed him with metastatic adenocarcinoma. It was unbelievable to him, for he was always healthy and had never thought of to be attacked by cancer. Like other cancer patients, Dhali Moham was suggested to take chemotherapy. However, having been frequently told about the side effect of chemotherapy, he refused it, although he didn’t know much about chemotherapy. He knew what waiting for him would be a series of side effects like nausea, vomiting and loss of hair once he took chemotherapy and his body would become even weaker. He told his doctor that his refuse to chemotherapy didn’t mean to stop treatment but to seek for better treatment. Seeing his resolution, his doctor recommended him to go to China, saying that there are more options for him in China. His determination to go to Guangzhou, China for treatment won the support of his family. 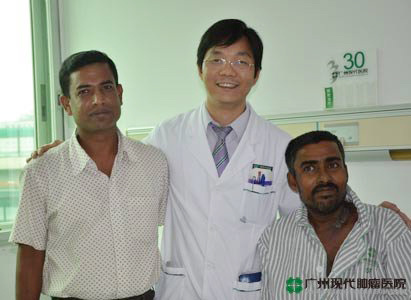 On May 10, 2013, Dhali Moham arrived at Modern Cancer Hospital Guangzhou under the company of his younger brother. To their surprise, such an oversea medical trip was not that difficult as they had thought. Language barrier and other problems they worried about before did not exist at all, for there are professional interpreter team, pick up servicers and many other thoughtful services. 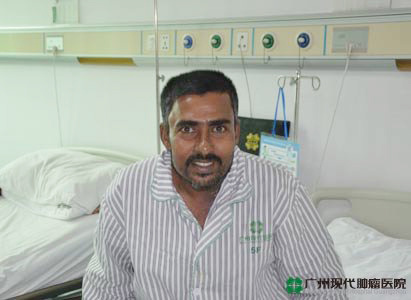 In Modern Cancer Hospital Guangzhou, Dhali Moham underwent biopsy test on his left neck lymph nodes and was further diagnosed with adenocarcinoma with left neck lymph node invasion. Compared with the first examination, the tumor had enlarged from 2*3 cm to 7.2*9.0 cm. Specialists held a joint consultation for Dhali Moham’s case and worked out an individualized treatment plan for him according to his specific condition. It was his first time to know about particle seed implantation, the minimally invasive cancer treatment technology. It is non-surgical, but can receive a treatment effect as good as that of surgery, without harming normal human organs. The particle seed implantation was done under local anaesthesia, so Dhali Moham stayed awake during the procedure, which was very successful and brought no discomfort to him. Dhali Moham could not help marveling at the amazing particle seed implantation technology. Now the tumor in his neck has obvious shrunk and the symptoms like pain and cough also have disappeared. He expressed his gratitude to all the medical staffs of Modern Cancer Hospital Guangzhou for their attentive care. Meanwhile, he hoped that all cancer patients like him can access to such effective treatment.